Mobi Bike! I like the baskets, as you can see, I have my backpack in the basket. 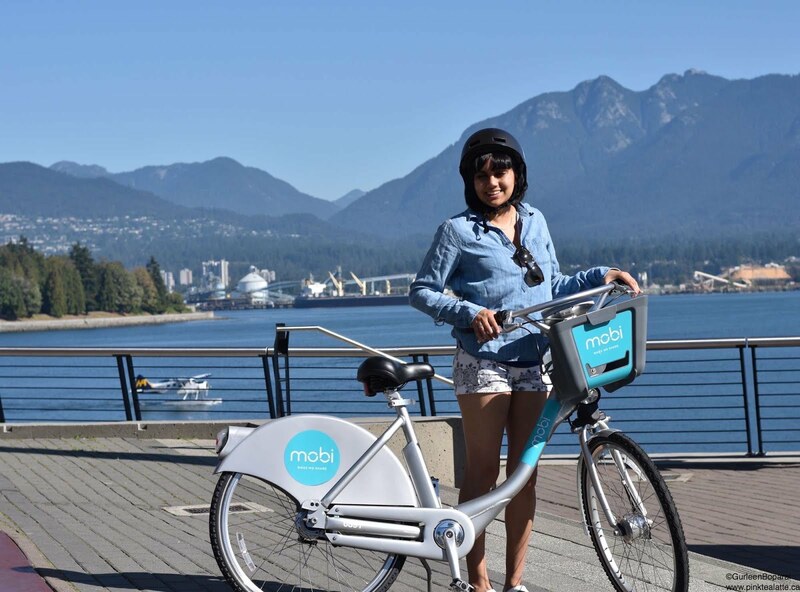 There is something new, blue and on two wheels that have been popping up all over Vancouver this summer: Mobi Bike Share! The Vancouver bike sharing program had its soft opening on July 20th. At that time, only "founding members," the first adopters who chose to purchase a year pass had access to the program only. 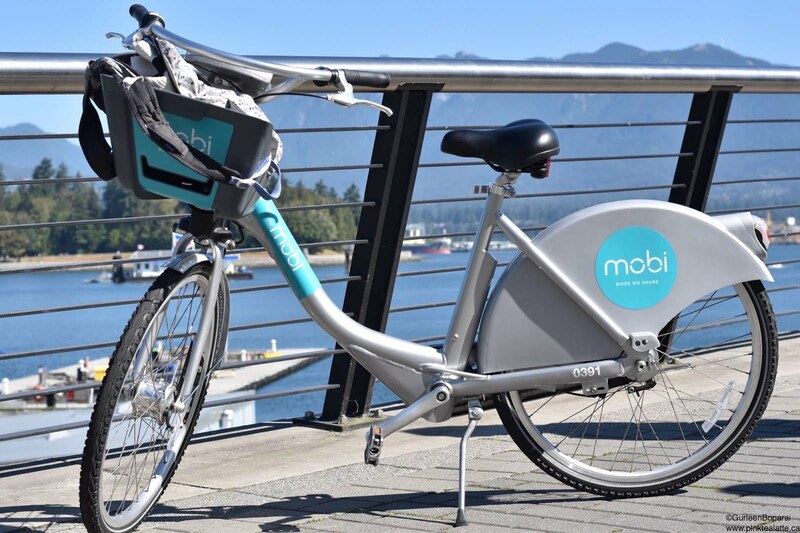 Not to worry if you did not grab a founding members pass, Mobi has now gone public and everyone can hop on a Mobi Bike with a daily or monthly pass. As the summer goes on, Mobi plans on expanding from its current 64 stations with 600+ bikes to a total of 150 stations with 1,500 bikes. At this time, Mobi services are within the downtown peninsula; bounded by Arbutus street and 16th avenue and Main street. Expect to see a Mobi bike station every 2 to 3 blocks. 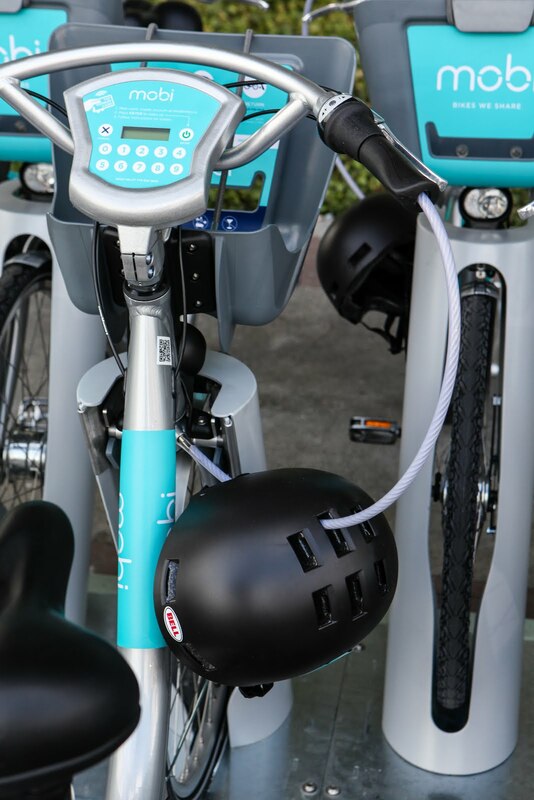 I decided to check out Mobi bikes to find out how the bike sharing program works, as well as, why bike sharing is a great option. Starting with why it is amazing that Vancouver now has a bike sharing option! If you study at UBC or ride a bike as your daily commute in Vancouver, you are probably well aware of the ridiculously high number of bike thefts that take place within the lower mainland. I am not exaggerating, just this past year, 2015, a total of 3,132 reports of stolen bikes were filed with the Vancouver Police Department. When I was on the Varsity Men's Rowing team at UBC, my coach came in one practice with a gorgeous brand new carbon fiber frame bike. Unfortunately, none of us even imagined that my coach's bike would be stolen within the week. More astonishingly, a friend of mine had his bike stolen right from inside his own work office! Now that is ludicrous! I refuse to ride a bike without a helmet, so it is amazing that every Mobi bike has a helmet with them. They may not be the most stylish accessory to wear, but they can save you in a fatal accident. A bike share program is really going to help alleviate the stress of having your bike stolen as well as being tampered with. Furthermore, Vancouver has great weather year round and we have a lot of bike infrastructure in place. Such as the numerous bike lanes along main roads as well as the sea walls making Vancouver a prime candidate for a bike share program. The Vancouver demographic is health conscious, outdoorsy and is always at the forefront of environmental initiatives. The Mobi bikes are really going to help reduce our carbon foot print and hopefully traffic congestion. The France-manufactured bikes are very sturdy, but the bikes frames are on the heavier side. Checking out the bike from the station was fairly simple. Scanned the Mobi fob, entered the pin and the bike was unlocked. I like how they were smart about putting the bike lock into the handle bars to save space. Therefore, if you do need to lock up the bike for a quick moment, you simply pull out the bike lock from the handlebars. Though helmets are provided, the current ones are pretty big. No matter how tight I made the straps, the helmet would fall forward or back. Furthermore, the helmets are sanitized only once a week and deep cleaned once a month. Mobi does plan on providing helmet liners in the future. They also plan on getting new helmets that will hopefully fit my small head better. I spin bike quite a bit, so I found the gears on the bike really did not provide much resistance. However, if you tend to not bike often, the 7 available gears should be enough. All of the bikes frames are the same size with adjustable seat heights. I am 5ft 1inch TALL and I had to have the bike seat all the way to the bottom. Perhaps Mobi can look into providing two different sizes? I like how there is a basket on the front to store your bag/items as well the bungee cords ensure your items will not fall out during your ride. If you look closely, you will notice a light on the rear bike cover. The light automatically turns on while you are pedalling. I really like this feature as it will definitely increase your visibility if you biking in the dark to alert any motorists/pedestrians as well as other bikers around of your presence. If I have trouble with using Mobi, it is great to know that there is 24/7 support available. A hinderance to using Mobi would be their price point. It practically matches the already very steep Translink pricing and far exceeds other bike sharing program in Canada. I would like to see it become more accessible not just in location, but also in affordability. 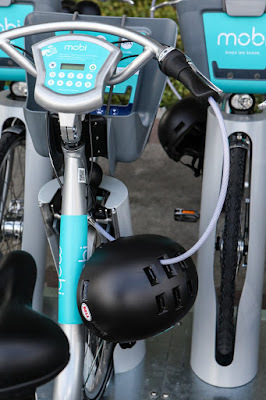 To retrieve a bike from a station, you use the keypad on the handlebar. The helmets secure to the bike via the bike lock. I definitely see the bike sharing program proliferating in Vancouver. The program is still very new and will most likely go through a lot of fine tuning and adjustments to suit Vanocuverites best. I hope to see Mobi achieve the meaning behind their name "more bikes" since it is a healthy commuter choice and also has the added benefit of reducing traffic congestion.